An artists rendition of how the SKA-MID dishes in Africa will look when contructed. Scientists from around the world have joined forces to lay the foundations for an experiment of truly astronomical proportions: putting together the biggest map of the Universe ever made. In a series of papers published today on the arXiv.org astrophysics website (http://arxiv.org/list/astro-ph/new), an international team of researchers, including a team from The University of Manchester, set out their plans for the mammoth survey. Researchers from the Cosmology Science Working Group of the Square Kilometre Array (SKA) have worked out how to use the world’s largest telescope for the task. The SKA will be a collection of thousands of radio receivers and dishes spread across two sites in South Africa and Western Australia. 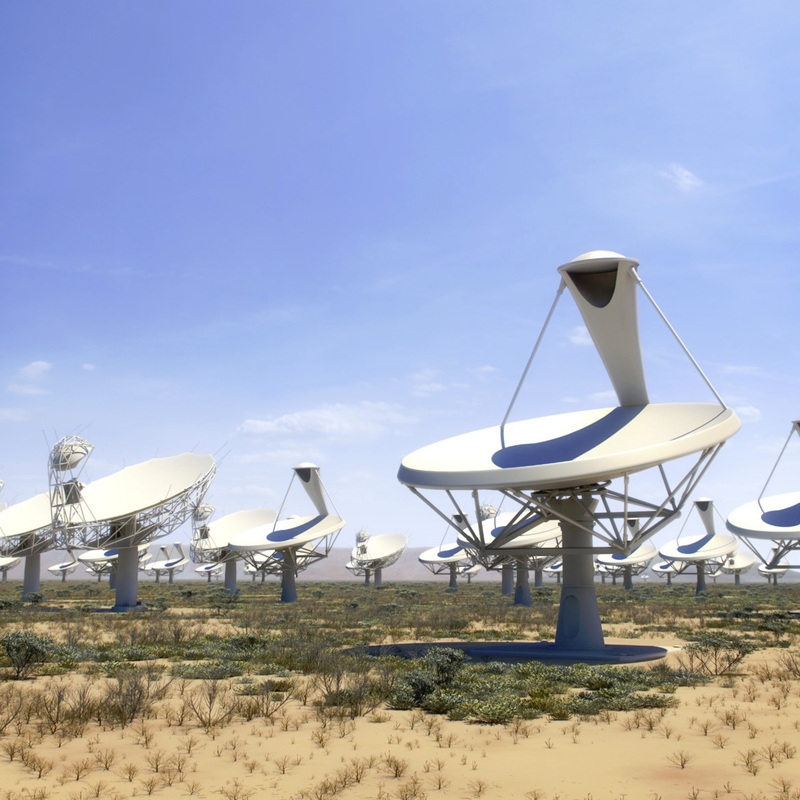 When the first phase is completed in 2023, the SKA will have a total collecting area equivalent to 15 football pitches, and will produce more data in one day than several times the daily traffic of the entire internet. A second phase, due around 2030, will be ten times larger still. Such a huge atlas of the distribution of matter in the Universe will also open a new window to investigate the first moments after the Big Bang. “What happens on ultra-large distance scales tells us something about how the newborn Universe behaved when it was only a tiny fraction of a second old,” said Stefano Camera, at the Jodrell Bank Centre for Astrophysics at the University of Manchester. The measurements will allow researchers to more closely scrutinize “cosmic inflation“, the process that is believed to have sown the seeds of structures like galaxies and superclusters that we see today. The 2D maps will also provide a new way of seeing how light rays are bent by gravity – an early prediction of [Albert] Einstein’s theory that was first measured by[Sir]Arthur Eddington and others during a solar eclipse in 1919. “By measuring tiny distortions in the shapes of galaxies seen by the SKA, we hope to track the evolution of structures in dark matter over cosmic time” said Ian Harrison, also at The University of Manchester. The researchers hope that this will provide more vital clues about the nature of dark energy, and how structures formed in the Universe in the first place. Because of the vastness of the surveys, the SKA will be able to discover many rare objects such as strong gravitational lenses, where distant objects are magnified and multiply imaged by the gravitational action of foreground galaxies. “This allows accurate mass measurements of very distant objects, and is important for understanding galaxies as well as learning about cosmology.” said Dr Neal Jackson, University of Manchester. The key to mapping the cosmos is to detect the faint radio emission from hydrogen gas. “Hydrogen is the most common element in the Universe, so we see it everywhere” said Phil Bull, from the University of Oslo in Norway. “This makes it ideal for tracing the way matter is distributed throughout space”. This includes the mysterious dark matter, which is completely invisible to telescopes, but can be detected through its gravitational pull on other objects, like hydrogen-containing galaxies. In addition to 3D maps of the hydrogen radio emission, the SKA will also make two-dimensional maps using the total radio-wave emissions of galaxies. “These maps will contain hundreds of millions of galaxies, and billions in Phase 2, allowing us to test whether the shape of the Universe is as simple as our theory predicts”, said Matt Jarvis from Oxford University, UK. Jarvis is referring to a series of fundamental physical principles, dating back to [Nicolaus] Copernicus in the 16th Century, which state that the shape of the matter distribution should look about the same on average, regardless of the direction you point your telescope. Recent observations have revealed troubling hints that this property, called “statistical isotropy“, may not hold however. “If this turns out to be the case, there would be very serious ramifications for our understanding of the cosmos,” said Dominik Schwarz, at the University of Bielefeld in Germany. Jodrell Bank Centre for Astrophysics comprises research activities in astronomy and astrophysics at The University of Manchester, the world leading facilities of the Jodrell Bank Observatory, the e-MERLIN/VLBI National Facility and the Project Development Office of the Square Kilometre Array.